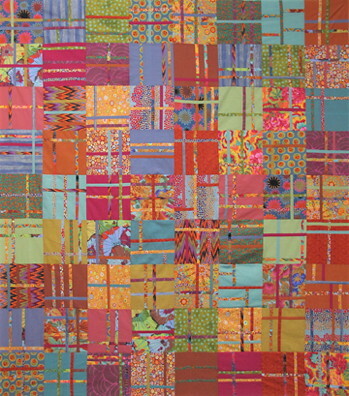 Batik quilt, made by Jean Wells from a pattern by Kaffe Fassett. Pattern available in the book "Kaffe Quilts Again." * Upon requests we are working on a starter kit for this quilt. Stay tuned and we will let you know when it is ready! Summer is arriving, along with all of the new fabrics for Quilt Show! We are busy rearranging the shop to find space for it, and working hard to get it on the website for all to see....Exciting times. Valori's newest line Quill is in the shop and on the website. A beautiful collection based on friendship & generosity, inspired by distinct personalities on a journey to embrace their lives with gratitude & clarity. Also both the Quill Essex - Cotton & Linen Blend Fabrics and the Quill Knit Fabrics have arrived. Beautiful collection, beautifully priced check out our web site! We still have classes and lectures open for Quilters Affair 2014, check it out on the website. Be sure to click on "Workshops" at the top of the page. A menu will drop down, then click on the day of the week, you will see all the classes, a brief description and which ones are open. You can register online. Jean Wells Keenan will be teaching her popular intuitive quilting workshop, Simply the Land. At the Sitka Center for the Arts on the Oregon coast May 29-31. Let the flowing forms of nature inspire your design in this workshop that focuses on line and color. Jean uses short exercises to help you plan and execute your original design in fabric. The Sitka Center campus is a beautiful - Literally a center at the edge – where land meets sky, saltwater meets freshwater – the Sitka Center is a place where a diverse group of people and ideas converge, co-mingle and depart transformed. If you are interested in joining this amazing workshop visit www.sitkacenter.org and register today! Freddy Moran is returning this spring! from the workshop last fall. Notice the work above...yes, it is a self portrait! Freddy is an absolute hoot! If you've never taken a workshop with her, you won't want to miss out~ here she is with our very own Jill B who loved Freddy's workshop! This very well could be the most fun workshop you will ever take! You could feel the buzz and energy coming from the Rosalie Quilt class, it was awesome. The class featured our Rosalie quilt pattern, a great (easy) hexagon technique. The students were having so much fun with the hexagon quilt and each one had their own take on the quilt, using different colors and themes. One student went with a holiday theme another with a vintage flare. We loved the idea that several of the ladies had...It was a quilt class birthday party! One of the gals organized her girlfriends to join her for the class for her birthday! Happy Holidays and Happy sewing! Click here to see an album of student work! A new session of Absolutely Beginning Quilting begins in February. Look for details in our Spring/Summer 2013 Class Catalog arriving in mailboxes in January. If you have a friend who wants to start quilting send her this way...Lawry is the best teacher! I absolutely loved watching the students in Lawry's Carpenter's Square class. They each approached the class with their own twist to a classic quilt pattern. Here are some photos as they went along and a few finished products. This student decided on a dark background.... nice juxaposition! The green and white version. Ginn's fun grey and white version, beautifully quilted by Laura! Congratulations ladies, these quilts look stunning! Maybe you should try your hand at this great pattern? Lawry put together a wonderful pattern with great step-by-step instruction. You can find the Carpenter's Square pattern on our website.